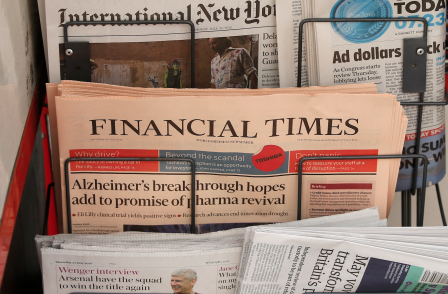 Journalists at the Financial Times have written to the paper’s prospective new owners asking for written guarantees of editorial independence. Japanese business publishing giant Nikkei agreed on Thursday to buy Financial Times Group (excluding its half-share in The Economist) from Pearson for £844m. No guarantees about editorial independence were written into the deal. The Financial Times claims to have some 580 editorial staff, who are represented by an officially-recognised National Union of Journalists chapel. NUJ representatives have written to the new owners saying: “As an independent part of the already fiercely independent culture at the Financial Times, we would like to open a dialogue with you that offers us more detail on the terms of the sale and on the future structure of the company as part of the close communications that you are urging. “As a democratic voice within the FT culture, the NUJ chapel (branch) has urged fairness and transparency in its work culture and its conditions of employment. We would like reassurance that this will continue under your leadership. “Our regular meetings with managers have been an important part of managing change – including digital change. As you are an employee-owned organisation, I would hope that you would acknowledge and respect this tradition of worker participation. Nikkei chairman Tsuneo Kita and president Naotoshi Okada gave assurances about the future of the FT to journalists in a letter on Friday. It said: “The Financial Times will continue to enjoy complete editorial independence and freedom, just as all news organisations should have. “We hope that John Ridding and his management team will continue to lead the trustworthy pink paper into this new chapter." The purchase price is 35-times last year's stated operating profit for the FT Group (minus The Economist) of £24m. But the new owners have told staff they will not seek to cut costs in order to secure a quick return on investment. They said in their letter: “We want the FT to be extremely profitable, and we want to achieve this through investments that lead to more customers and exciting new products, not through a reduction of the workforce. “Nikkei is a private, employee-owned company. We are not under pressure to pursue short-term financial performance. “Our style is to make investments based on a long-term perspective, and we hope to invest in the FT in order to bring out its full potential. “In the course of this transaction, we have made these points clear to your management numerous times, but we wanted to reiterate them to every one of you." Explaining the thinking behind the deal, they said: "FT and Nikkei are very complementary, thanks in part to our respective geographic locations. Pingback: Is Editorial Independence Officially Dead?